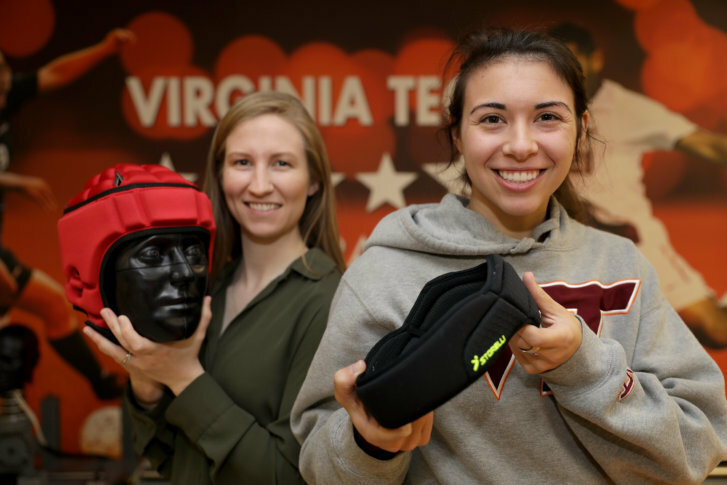 Research released Tuesday by the Virginia Tech Helmet Lab shows which protective headgear works best to reduce the risk of head injuries for soccer players. WASHINGTON — The best way to prevent sports-related concussions is not to hit your head, but research released Tuesday shows which protective headgear works best to reduce the risk of head injuries for soccer players when collisions do happen. The headgear is meant to prevent the most common type of concussion in soccer — one that occurs when two players knock heads when both are trying to head the ball. “What we found is that the forces associated with an impact like that could be as high as 150 g’s, which is a very hard hit,” Rowson said. Laboratory testing determined that better models reduce impact forces by more than 50 percent, and concussion risk by more than 70 percent, Rowson said. Some of the poorest-performing headgear, he added, is equivalent to having no protection at all. Sensors embedded in test dummy heads measured linear and rotational acceleration for the calculation of a STAR rating. The highest-scoring soccer headgear cap, the Gamebreaker Multi-Sport Headgear, earned four out of five stars and costs about $75. The headband offering the best protection, Storelli’s ExoShield, reduced the risk of injury 84 percent for the impacts tested, according to researchers. It costs about $60. Find soccer headgear ratings for 22 models here. Soccer’s international governing organization, the Fédération Internationale de Football Association (FIFA), approved the use of protective headgear in 2004. It’s currently not considered “normal” to wear protective headgear in soccer. No leagues require them. They’re optional equipment. Some players who’ve had a history of injury wear them. Some parents worried about kids having concussion have their children wear them. “Now that there are data, you may see more and more people begin to wear them, because some of them certainly are effective at reducing risk,” Rowson said. Helmet Lab evaluations currently include football and hockey gear. Within the next month, rankings will be released for bike helmets. This summer, rankings will include baseball and softball headwear. Youth-specific protective headgear rankings are expected this fall. The lab’s work is part of Virginia Tech’s service mission and is independent of any funding from manufacturers.